AdvantaClean of Wexford in the North Pittsburgh area can provide you with specialists in the North Pittsburgh area with high quality mold and moisture removal and encapsulation services for crawl spaces. We can help you fix minor water leakage problem to severe problems such as mold growth. And our simple solutions such as crawl space encapsulation won’t cost you an arm and a leg. Fixing crawl space issues is important because it may lead to further problems such as wood rotting and greater power consumption. Our products are of high quality and they last long. Our expert work ensures that you meet your goals and remain worry-free. 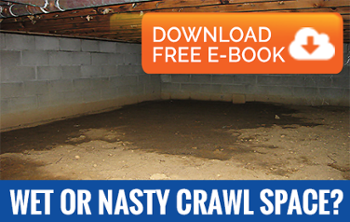 Repairing or fixing a mold-infested and unhealthy crawl space can be tricky. If this is not done carefully, chances are that the problem will recur after sometime. So it’s better to take preventive measures than spend a large sum later on. You can actually save a lot of money directly by bringing about reduction in energy bills and repair-related expenses. If you have encapsulated your crawl space with a vapor barrier, you get extra storage space. A complete crawl space encapsulation or restoration work may include the use of a good drainage system with sump pump, a vapor barrier to reduce vapor drive from moisture-laden soil, and waterproofing sealer. If crawl space encapsulation and water proofing is not handled by a professional, it will lead to the recurrence of moisture problems that ruin the structure of your home.